20 April 2018 – Dig Delve – An online magazine about gardens, landscape, growing & making. It has been a long, slow start to spring, but at last we have movement. The snakeshead fritillaries are chequering the slopes behind the house and crossing over with early daffodils that this year were a whole two weeks late. The long wait will now see a rush as everything comes together, but reflecting the last few weeks of slim pickings we have kept things simple in this April gathering. The wet weather has hit hard this year and Tulip Fire has run rampant through the tulip bed. We mass the tulips together in a random mix of six or seven varieties in the kitchen garden and experiment with a new colour palette and untried varieties every year. This year we planned for soft reds, pinks, oranges and apricots with an undercurrent of deep purples. However, we did not plan for the angst that has come with the mistake of replanting too soon in the same place. The Tulip Fire (Botrytis tulipae) probably came in with the bulbs that were grown in the same bed two years ago. A dry spring that year most likely limited its impact and it went unseen. This wouldn’t have been a problem if we’d not replanted in the same place for three to five years. We will not be making the mistake again, for the majority of this year’s flowers are withered, pock-marked and streaked, the foliage melted on the worst affected. As soon as the flowers that are harvestable have been cut, we will dig up the bulbs and burn them on the bonfire. It has been a hard lesson after a long winter and one never to be forgotten, but we have managed to salvage enough to appreciate close up. 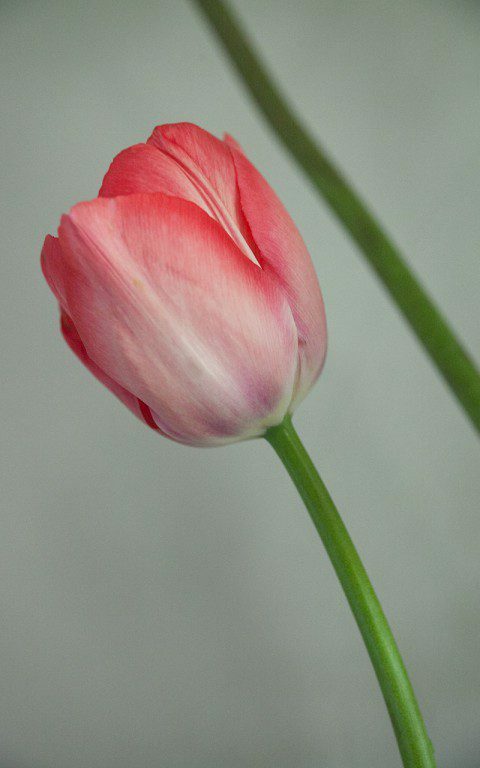 We will be trying Tulipa ‘Van Eijk’ again, for its faded pink exterior which conceals the surprise of a bright scarlet interior. The flowers enlarge and age gracefully, first to a strong lipstick pink before ending up a washed rose with the texture and shine of taffeta. It is said to be a variety that comes back for several years without the need for lifting, so next year I will try it by itself in some fresh ground. Planting in late November or early December when the weather is colder is said to diminish the impact of the botrytis should it already be in the ground. Grown on their own and not in the mass of different varieties, they may stand a better chance of staying clean. We have now kept a note to move our cutting tulips between beds on a five year rotation. 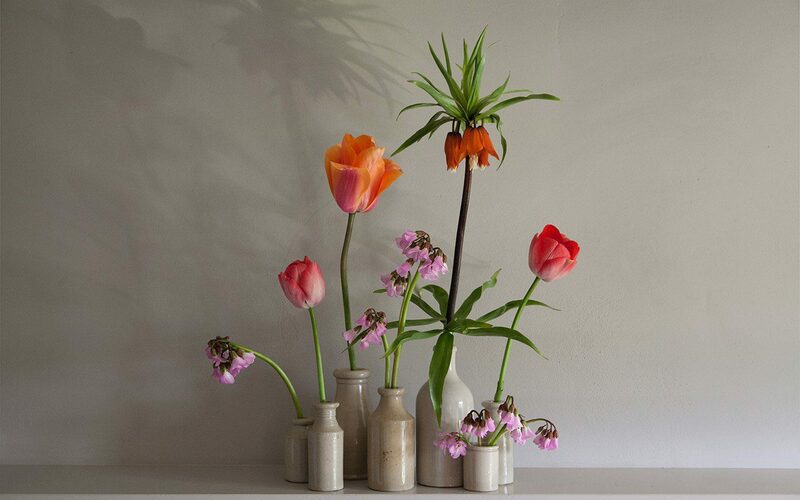 Tulips are remarkable for their ability to grow and adjust in a vase. The long-stemmed, large-flowered varieties exaggerate the quiet choreography that sees their initial placement becoming something entirely different as the flowers arc and sway. 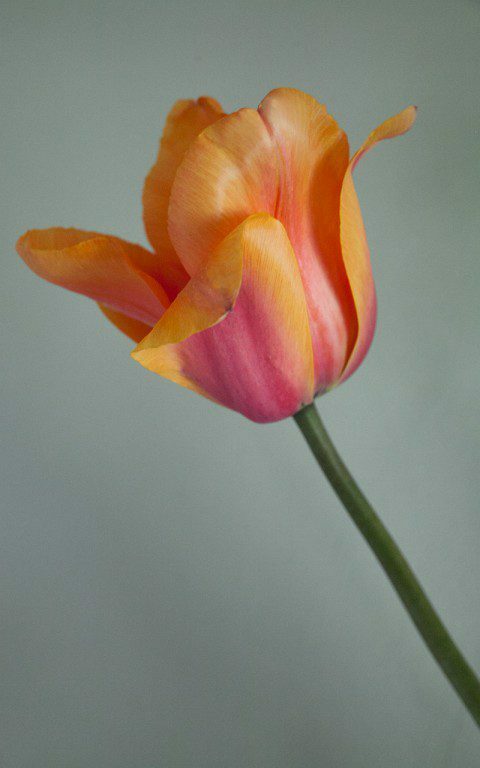 The complexity of colours in Tulipa ‘Apricot Impression’ is promising. The raspberry pink blush in the centre of each petal is quite marked to start with, but suffuses them as the flowers age creating an overall impression of strong coral pink bleeding out to true apricot. The insides are an intense, lacquered orange with large black blotches at the base and provide voluptuous drama as they splay open with abandon. Though our choice of tulips has been somewhat pared back this year, it is good to have enough to get a taste of the selections we’d planned. This is the first time I have grown the Crown Imperial (Fritillaria imperialis) here, and their story has been entirely different. Up early, the reptilian buds spearing the soil in March, and quickly rearing above the dormant world around them, their glossy presence has been so very welcome. I have drifted them in number on the steep slopes at the entrance of the new garden amongst the rangy Paeonia delavayi. 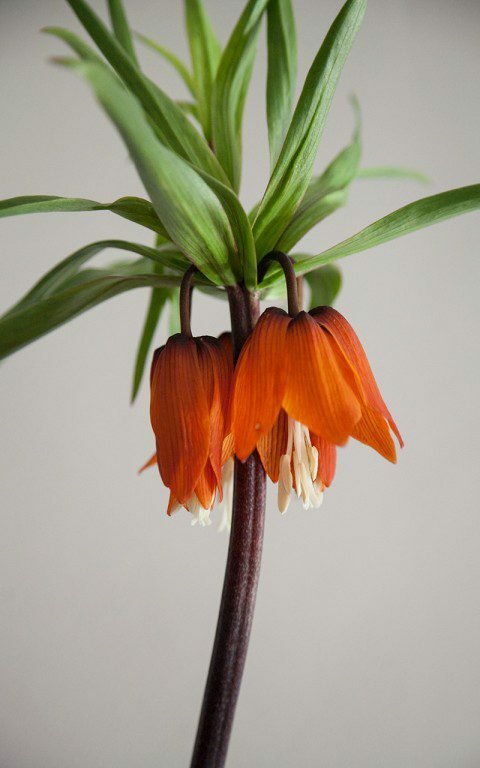 Fritillaria imperialis ‘Rubra’ has strong colouring with dark, bronze stems and rust orange flowers that work well with the emerging copper-flushed foliage of the peonies. Although there is an exotic air to the combination, it somehow works here up close to the buildings. It is a combination that you might imagine coming together through the Silk Route, China and the Middle East. However, plant hunters had already introduced the fritillaria from Persia in the mid 1500’s, and so it also has a presence that speaks of a particular kind of old English garden. At the opening of the Cedric Morris exhibition at The Garden Museum this week Crown Imperials were a key component of Shane Connolly’s floral arrangements, scenting the nave with their appealingly foxy perfume. The smell is said to keep rodents and moles at bay and, though potent, is not unpleasant in my opinion. Morris’ painting Easter Bouquet (1934) captured them exuberantly in an arrangement from his garden at Benton End, which updates the still lives of the Dutch Masters with muscularity and vibrant colour. Rich, evocative and full of vigour, the paintings confirmed to me why we push against the odds to garden. I planted half the bulbs on their side to see if it is true that they are less likely to rot, and the other half facing up. However, contrary to advice the two failures were bulbs planted on their sides. I also planted deep to encourage re-flowering in future years. The bulbs are as big as large onions, but it is worth planting them at three times their depth since they are prone to coming up blind when planted shallowly. In their homeland in the Middle East, they can be seen in the dry valleys in their thousands after the winter rains, so I am hoping that our hot, dry slopes here suit them. They are teamed with a late molinia and asters, to cover for the gap they will leave when they go into summer dormancy. 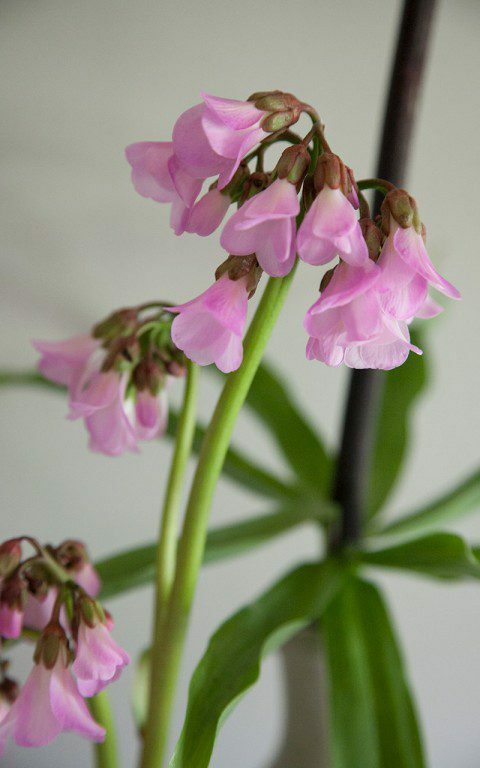 The third component in this collection is a pink hybrid form of Bergenia emeinsis. It was given to me by Fergus Garret, who tells me it was handed down by the great nursery woman Elizabeth Strangman with the words that it was a “good plant”. Sure enough, despite its reputation for not being reliably hardy, it has done well for me and flowered prolifically for the first time this year amongst dark leaved Ranunculus ficaria ‘Brazen Hussy’. However, the combination was far from right, the sugary pink of the bergenia clashing unashamedly with the chrome yellow celandines. A combination Christopher Lloyd may well have admired, but not one that feels right here. However, the elegant flowers are held on tall stems and the leaves are small and neat, so it has been found a new home in the shade at the studio garden in London, where it can be eye-catching when in season against a simple green backdrop. Though this recently introduced species from China grows in moist crevices in Sichuan, it is happy to adapt and is so prolific in flower that I had to find it a place where its early showiness feels right, rather than getting rid of a good plant. More lessons learned, and more to come now that the tide has finally turned.